Home > News > Who said size is important? After reading many claims that the Roller Power Head Speargun out performs traditional double rubber Spearguns, I couldn't resist putting it through its paces. The dynamic design has certainly been carefully thought out using a compact European handle along with 100% carbonic rail barrel. Thanks to this setting the spear shaft is accompanied all the way to the end of the barrel with greater force especially at end, resulting in a lot more speed and momentum, greater range and punching power at the end of the range, with less shaft whip and consistent accuracy. One Rubber and All Power These Roller Power Head Spearguns in fact utilise the underside of the barrel with pre-tensioned rubbers adding an extra 10-20% of power. This gun really does work hard using 100% of the barrel's length to propel the spear shaft compared with longer guns which use approximately 60-70%. Using the Roller Power Head kit, means that the wishbones comes to a complete halt at the bridge combined with the rubbers pulling in the opposite direction of the spear shaft means actual recoil is reduced quite dramatically. With a shorter shaft, it makes sense that you can move better especially in strong current and rough conditions but also it load easier than conventional spearguns. These Roller Guns feature an easy pully system that allows loading to be easy and quick - ideal for women and teenagers with less muscle mass I must say. They are a good 40-50% shorter than a similar performing standard speargun so you can take this guy almost anywhere - I'm thinking a trip to Fiji maybe in order! Available in 6 different sizes, they can even be 'powered up' further with a second standard rubber (not going through the rollers). This set up will propel an 8 mm shaft out at very high speed best suited for big pelagics (Wahoo,Tuna,Sailfish,Marlin). Option 1) Most popular (16mm main rubber + 14 mm additional rubber) to be used with a 8 mm shaft. 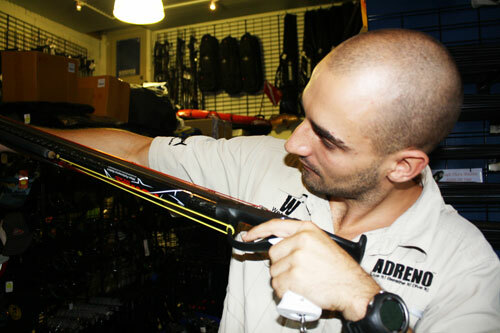 Option 2) For max power (18mm main rubber + 16 mm additional rubber) to be used with a 8 – 8.5 mm shaft. 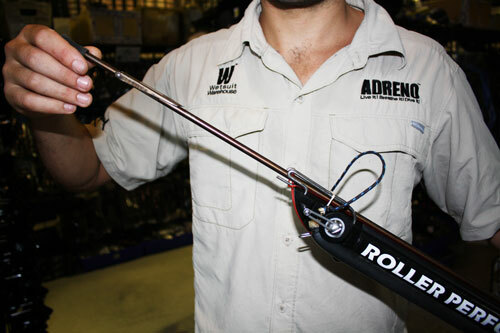 A 90 cm roller speargun fitted with 14mm is ideal for small to medium size fish up to 20-30 kg. 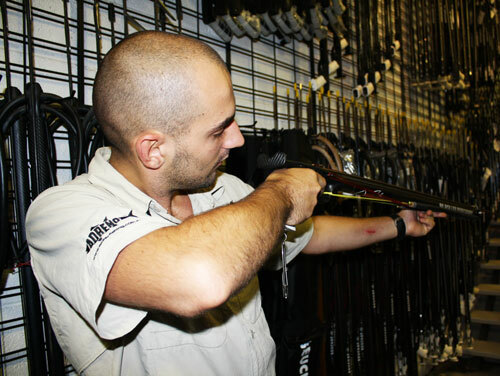 This is equivalent to a 120-130cm standard speargun. 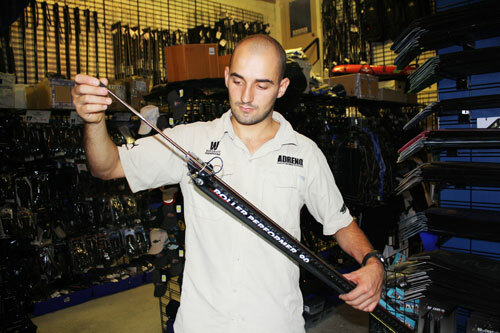 A 100 cm roller speargun fitted with 16mm is great as an all round speargun, great for reef fish to the odd big fish (Kingfish, Jew fish, Spanish mackerel etc.) This size is equivalent to a 140 - 150 cm standard speargun. A 110 cm roller speargun is generally used for blue water applications with a 16 or 18mm rubber. This size is equivalent to a 150 - 160 cm standard speargun. A 120 & 130 cm roller speargun is better suited for tall divers (190cm or more) with long arms as most people would struggle to reach the actual wishbone. This size is equivalent to a 170-180 cm standard speargun. 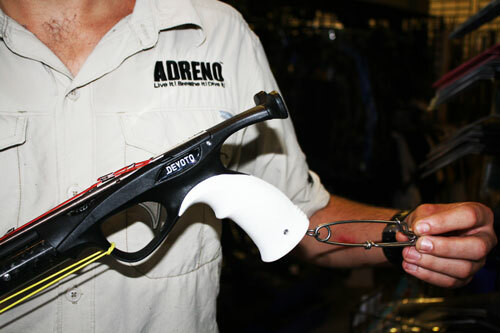 An optional wrist loader is available to help divers load longer models. The parts used are made in Australia from corrosion resistant materials and require virtually no maintenance. The kit has passed rigorous testing for the last 3 years, including no rinsing in fresh water for 12 months. The muzzle is machined from a solid block of acetal, and all the metal fittings are made from 316 stainless. The low friction bearings are made out of nylon with glass balls. All in all this is a diverse gun which can take the demands for hunting both big and small fish anytime. I certainly loved it and will be getting back out into the water with it very soon.